Home/Catamaran News/Sprint 15 News/Dreaming of a new Sprint 15 before the UK Sport Nationals? Dreaming of a new Sprint 15 before the UK Sport Nationals? 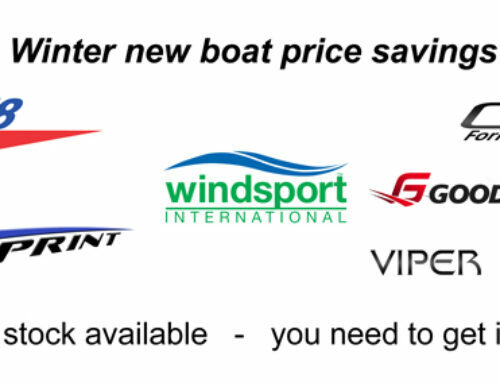 If you are dreaming about updating or buying a new boat this season then you need to consider that sales of New Sprint 15 ‘s for the first part of the season has just about kept up with demand leaving Windsport with only one stock boat un-allocated before the Sprint 15 Sport Nationals in early September. The new boats have been a great success with their new owners. We have had a deluge of complimentary comments on their finish and quality as well as the service and back up provided by the Windsport team. With the Sprint 15 class’s popularity stretching out in all directions and attracting a growing number of new recruits, there is a demand from sailors who are looking to buy good second-hand boats on the used boat market. So it is simple. If you want that new boat for the Sprint 15 Sport nationals in a few months’ time you are well advised to contact the Windsport team as soon as possible to find out the best package and if it is still available! Contact the Windsport team now :- info@windsport.co.uk +44 (0) 1326 376191. Peter2018-06-28T15:53:27+00:00Sprint 15 News|Comments Off on Dreaming of a new Sprint 15 before the UK Sport Nationals?